Once we'd had a look at the swathe of Common sunray (Triptilodiscus pygmaeus) on the edge of, and unexpectedly in, the paddock east of Dungowan Street the fate of the walk was sealed ... we became obsessed with plants. However we did see or hear at least 29 species of birds (30 if you count the Bowerbird I'd seen in a Marrakai Street garden the day before). We followed the track to the south of the forest but climbed up from it once we'd passed through the gate. This is an area where informed weeding will be needed as the yellow flowers of St Johns wort mingle with the yellow paper daisies. A "new" species of grass puzzled us all. Sharing space with the spear grasses this grass has a denser flower head which keeps its shape rather than opening-out. The heads droop slightly, giving an attractive ornamental effect and had a purple sheen. Perhaps it's Plumegrass, Dichelachne sp. [see footnote 1]. The kangaroo track through the forest moves through different understorey micro-habitats. The Donkey orchids (Diuris semilunulata) are past their prime but we found a few in good condition. Where water was still causing damp areas there were Sundews (Drosera spp.) and Billy buttons (Craspedia glauca), the latter a useful confirmation for the emerging plants species list. In most clusters of grass Onion orchids (Microtis unifolia ?) were present but camouflaged by being green. Native carrot has thrived with the rainfall pattern and was common. We picked some Sorrel to illustrate the subtle differences between this invasive weed and the native Common raspwort. 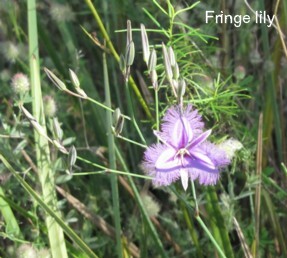 As it was sunny we soon found Common fringe lilies (Thysanotus tuberosus), the blooms' opening stimulated by the sunlight. Field madder (Sherardia arvensis) [see footnote 2] is an introduced bedstraw which has taken advantage of the dampness, as has a small, as-yet-un-identified sedge that's near the edge of the track where grading has built-up soil. Here another species new to The Pinnacle was found - Yellow centaury (Sebaea ovata). I'd seen it for the first time at Mulligans Flat north two weeks ago. From the start we'd pulled up isolated Patersons Curse and St Johns Wort plants. They were beheaded and the flowers bagged. Rita also gave the same treatment to some Flatweed & Catsears but they exist in their millions. She was the first to find Silky Swainson-pea (Swainsona sericea) this time. The plants were in the "usual" area but I expected them to have died down to invisibility by now . Austral bugle were in flower reminding me of the solitary large specimen we found in the Dam paddock on 18th Nov whilst weeding near the "BMX"-damage. 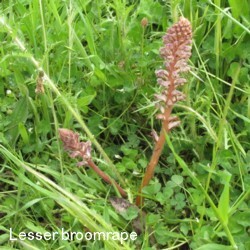 Lesser broomrape (Orobanche minor) is present in many places, parasitic on other plants' roots. It's an environmental weed in Cooma Monaro Shire and a noxious weed in surrounding shires according to the Woods' Field Guide [footnote 3]. Our first photographs had been of tall Bluebells growing up through a regenerating eucalypt where the sun was shining through the red of older leaves. Bluebells also wait for sunshine and were beautifully ubiquitous and intensely blue. Some were so tall they reminded me of the Native flax. Winding up the forest track we continued to see numerous brown butterflies ... possibly the Shouldered Brown Heteronympha penelope or the Common Brown, H. merope - grassy understorey and eucalypt forest species whose larvae feed on native grasses. An apparently-solo Imperial Jezebel Delias harpalyce refused to be photographed. After the browns its colours were startling. The Hairy appleberry (Billardiera scandens) is in flower; the bell-shaped blooms look Correa-like. Behind the houses some orange and red pea-flowers were still colourful and the large groups of Lilies (Dianella revoluta) were deeply blue with orange anthers. A Mountain kangaroo apple has persisted behind someone's fence and its blue-purple flowers rivalled the colour of the Dianellas. Some judicious weeding could enhance the backyards' interface with the reserve. Along the track the presence of Capeweed and an increasing patch of French catchfly show how readily graders actions encourage seed germination or bring in the exotic plants' seeds. A walk with Friends of Grasslands and Field Naturalists into the magnificent Goorooyarroo Reserve today (21st Nov) revealed similar looking grasses. 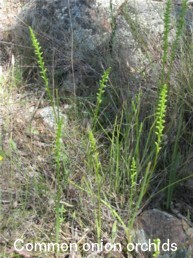 The experts' opinions had centred around Stipa densiflora for what we were seeing in The Pinnacle Reserve. This may be a mis-identification on my part. I await a species list from the Goorooyaroo visit. Thank you Julie, Sybil, Rita and Nola for sharing a stroll in perfect spring weather!